Five RealSelf employees recently traveled to India to be counselors at Camp Karma, a burn-survivor camp for children. With the help of non-profit partner, ReSurge International, our employees were given the once in a lifetime opportunity to truly make a difference in the lives of these children suffering from severe burn injuries. This camp provides the children with a chance to escape the challenges associated with their injuries and just be kids at camp. Several of our employee counselors pictured below offer quotes highlighting their personal experiences at Camp Karma. 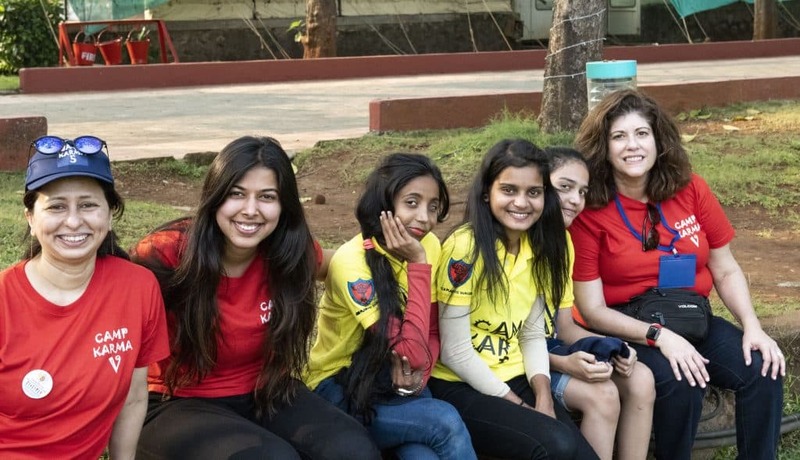 In red from left to right, Dr. Puri the camp Founder and Director, Priyanka from RealSelf and Michelle Nathansan from ReSurge International enjoying time with some of the campers. Camp Karma is a safe haven, where kids can find a sense of community in others they can relate to without being treated differently. Being with others who have suffered similar burn injuries is healing in itself as it decreases the sense of isolation and stigmatization that many burn survivors experience. Camp Karma promotes a healing environment by providing the kids an opportunity to have unique experiences in nature like, zip lining and ropes courses. The camp brings in volunteers who rally around the kids and provide a caring and supportive environment to laugh, joke and sometimes wipe away the tears. New journeys began, friends are made, confidence is built and everyday stressors of being a burn survivor are sidelined. Lakisha (middle) and Priyanka (back left) enjoying a selfie with the campers. Meredith (in yellow) with a group of female campers are all smiles at the camp’s ropes course. Visit our Giving Back page for updates on the program and to donate directly to ReSurge International to ensure inspiring efforts like Camp Karma can continue. Stay up to date with RealSelf employee life on our RealSelfLife Instagram and Facebook pages!